Climbing Adventure campers spend their days practicing the knots, equipment, and techniques needed to rock climb outdoors. This program is designed to develop skills and knowledge that allow campers to feel comfortable on progressively more challenging climbs. 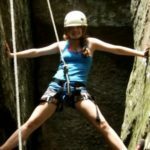 The beginning of the session is spent climbing at Pakentuck on Camp’s property and culminates at Jackson Falls, an amazing climbing area within the Shawnee National Forest. One day is dedicated to learning to ascend a rope high into the forest canopy with a professional tree climber. Nights are spent camping at nearby back-country sites where participants cook and relax together. 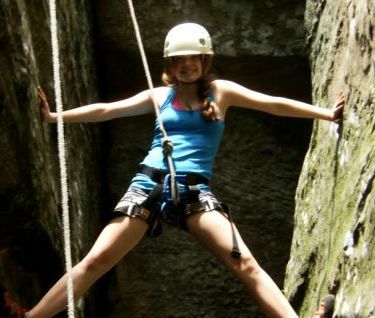 Read the Climbing Adventure Itinerary to see what you’ll be doing.